These 14 gram Tri-Color Ace/King Clay Chips are 39 mm diameter casino-sized chips and are designed with an authentic soft clay look and texture. They are crafted of a solid clay-like material, with an inconspicuous metal insert. These chips were created to produce a heavy chip with the real sound and feel of an actual Casino chip. Few chips on the market today can boast 3 colors and we are proud to offer these colorful and one-of-a-kind chips. 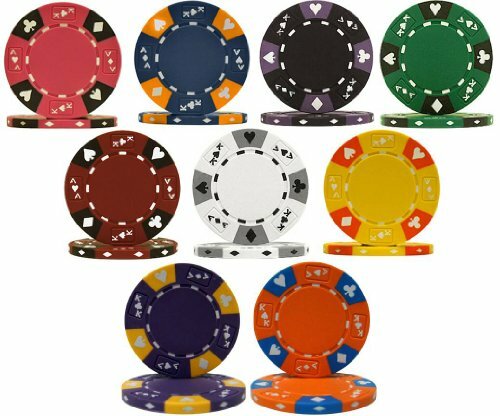 With card suits decorating the outer rim of the chip in either black or white and alternating Ace/King cards, these chips are available in your choice of 5 different color combinations. With a fine assortment of tri-tone colors, this exclusive chip line looks great too! Few chips on the market today can boast 3 colors and we are proud to offer these colorful and one-of-a-kind chips. 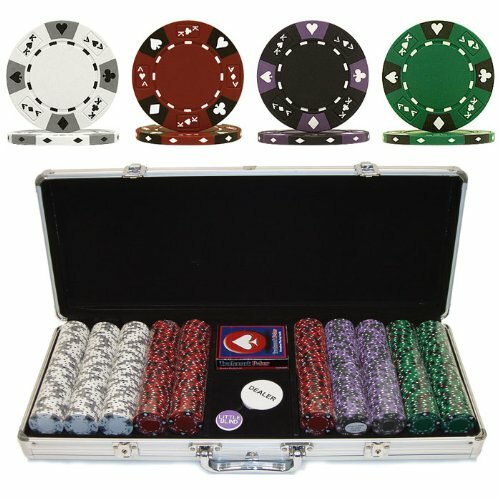 With card suits decorating the outer rim of the chip in either black or white, and alternating Ace/King cards, these chips are available in your choice of 5 different color combinations. These chip cases will offer the most protection for your investment. They are made of heavy duty, yet lightweight aluminum available in brilliant silver. The interior is black felt with space for 1000 chips. Don't be fooled by lower quality items. We have taken great care to ensure this case has the upgraded strength where required. This is the chip case that will last a lifetime. These 14 gram Tri-Color Ace/King Clay Chips are 39 mm diameter casino-sized chips and are designed with an authentic soft clay look and texture. These chips have the soft feel of a clay surface which makes them the most authentic poker chip available on the home gaming market. Get these quality clay chips at a fraction of the cost of authentic casino clay chips. They are crafted of a solid clay-like substance, with an inconspicuous metal insert. These exclusive chips were created by the use of the latest technology to produce a heavy chip with the real sound and feel of an actual Casino chip. 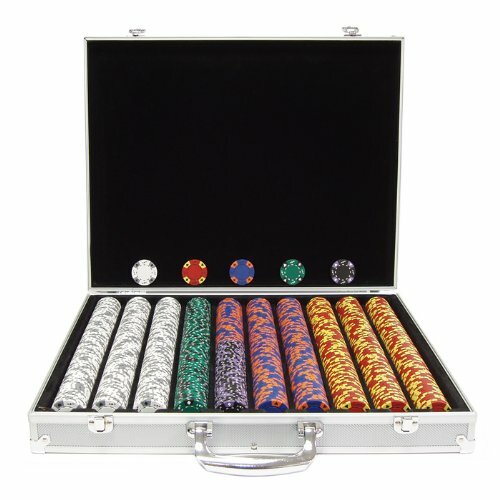 Chips are protected in an aluminum case which will provide the most protection for your investment. It is made of heavy duty, yet lightweight aluminum. 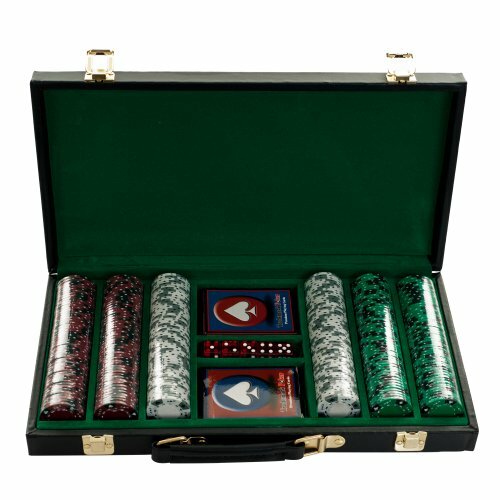 The interior is black velour with space for 500 chips, 2 decks of cards and 3 buttons. The handles are are securely riveted for long lasting use. 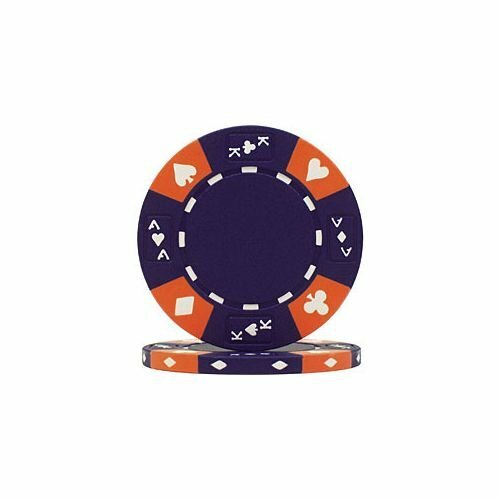 TMG Ace King Suited 3 Color Clay 14gm Poker Chip Sample Set - Includes Bonus Chip Spacer! http://www.flop2river.com/Tri_Color_Suit_Poker_Chips_p/tc-50-10-1800.htm Tri color suit poker chip Video features shuffle sounds, close up view and inside of poker chips. Want more Tri Color Suited Casino Chips similar ideas? Try to explore these searches: Button Down Woven Shorts, China Toilet Seat, and Bright Cactus Apparel.